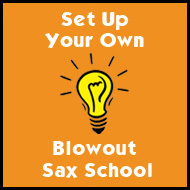 SaxGroup is an open ensemble of intermediate students from Blowout Sax. SaxGroup meets every other Saturday and focuses on rehearsing a jazz and funk repertoire through ensemble playing. 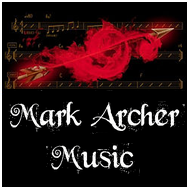 The unique and exciting features of the group are that all repertoire is learnt by ear and that all band arrangements are composed by the group. It's a challenging experience but SaxGroup members really enjoy learning great new tunes, playing with others and stretching their ears. If you are a sax player with twelve months (or more) of playing under your belt and you don't mind a bit of a challenge and you're keen to play with others then SaxGroup might be the ensemble for you. If so, contact Stan. Many players are frustrated by the quality of reeds on the market. Even when he or she finds a brand that they prefer, it is rare that the majority of reeds in the box will respond equally well. In any new box there are always one or two satisfactory reeds, a few mediocre ones and quite a few 'dogs'. Good reeds are not cheap and it seems a shame that we all have to put up with so many indifferent examples and so many 'dogs'. Of course, there are many reed adjustment technologies currently on the market to help the frustrated saxophone player but these tend to be too expensive or too complicated or they require specialised tools and equipment. All of these products seem to imply that you need the skills of a fully trained instrument repairer to contemplate even attempting any kind of reed adjustment. Stan is currently working on his simple, effective and cheap answer to Reed Rage. ReedRubber requires only one piece of specialised equipment (easily obtainable from any good hardware store). The technique required takes barely ten minutes to master (five minutes if you're paying attention). The instruction manual runs to barely a full page (half a page if you speed read). ReedRubber is being beta-tested as we speak. The complete kit will be available from the Blowout School website in the very near future. Watch this space. Sax teachers often advise students to purchase chromatic tuners to help with their intonation. There is nothing fundamentally wrong with this advice but it does overlook one important aspect of musical performance. Most tuners use some form of visual display. This has the effect of forcing the player to use their eyes rather than their ears to check that they are playing in tune. The new Blowout TuneUp CD takes a radically different approach to the task of 'tuning up'. On the CD there are minute-long tracks for each of the tones produced by the saxophone (including a large chunk of the altissimo range). The CD uses accurate recordings of a real saxophone played by a real saxophonist so that the student can compare their sound with a genuine sample of correct tone and intonation. There is one CD each for the alto or tenor saxophone. But TuneUp is more than a tuning CD! 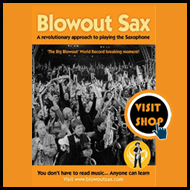 Packed into the handy booklet (that fits snugly into your sax case) are lots of interesting and valuable exercises that help the player to explore their own creativity with the recording. The Blowout TuneUp CD will soon be available from this web site. We'll keep you posted!